July 2, 2018 – Our time machine strikes gold in Nevada’s Comstock Lode — a world-record vein so immensely valuable that it changed the destiny of the United States as the Civil War loomed. 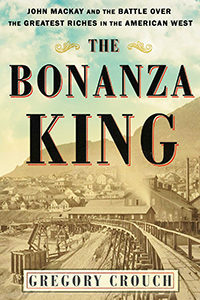 Our guide on this journey is Gregory Crouch who brings us: The Bonanza King: John Mackay and the Battle over the Greatest Riches in the American West . It’s the history-making, rags-to-riches story of an Irish immigrant who made his fortune, won the love of his adopted country — and then fell from the national memory in part because nobody had a bad word to say about him. Gregory Crouch’s previous books include the World War II flying adventure China’s Wings and the alpine memoir Enduring Patagonia . He studied history at the United States Military Academy at West Point, completed U.S. Army Airborne and Ranger schools, and led two infantry platoons. Visit him at GregCrouch.com, Facebook.com/GregoryCrouchAuthor, @GregoryCrouch on Twitter, or Gregory.Crouch on Instagram.